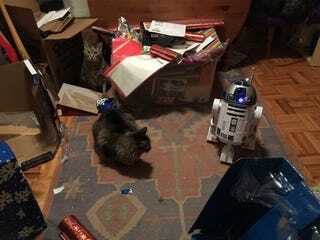 They were sooooo very not into their gift tonight, which was an R2-D2 robot. They didn't even pretend to enjoy it, they just acted like it was scary and kind of ran around and acted unhappy. RUDE. Cats spoil Hanukkah. Always. Give 'em gelt, they puke. Give 'em robots, they act like jerks. Sigh.